I would just like to smack that Deborah Bradley upside her lying head. Poor baby Lisa. Can Kansas City Chiefs Help Search for Lisa Irwin? The six month anniversary of the disappearance of Lisa Irwin from a northside Kansas City home is April 4. Half a continent away, another notable disappearance happened in San Francisco. Teenager Sierra LaMar has been missing since March 16. Quarterback Alex Smith joined a group of 700 volunteers who searched for the girl. What would have happened had a prominent member of the Chiefs joined in the search for Lisa Irwin? The case would have gotten more notoriety in Kansas City had a player like Matt Cassel help a group of volunteers. After he got injured and was out for the year, Cassel had plenty of free time on his hands. It comes down to a matter of passion for a particular case. If Cassel had a baby himself, perhaps he would have signed up for the cause. Perhaps Smith put him in the shoes of the parents of the missing 16-year-old. What would have happened if that were his own daughter? The same can be said of any prominent member of the Chiefs in Kansas City. While the team was going through a woeful season in 2011, the Chiefs probably could have used a little community outreach. Smith is doing this volunteer work on his own apart from the team. He is stepping up on his own and got no publicity for the work, even though a fellow volunteer reported the quarterback's presence in the search. The Lisa Irwin search could have used more positive volunteer influences from the start. The latest news out of the case revolves around a man named "Jersey" who was sentenced to five years in prison for tampering with a vehicle. KCTV reports the man is just one of several characters involved in the northside disappearance. Perhaps it is a matter of perspective. ABC News stated Lisa Irwin's parents are from a working class neighborhood. Jeremy Irwin, age 29 and Lisa's father, has children from a previous marriage that became a custody issue in the case. Deborah Bradley, age 25 and Lisa's mother, admitted to being passed out and drunk the night her 10-month-old daughter disappeared. The LaMar case is different. NBC Bay Area reports the young lady disappeared from her driveway while waiting for a school bus in the city of Morgan Hill, Calif. The city is much more upscale than the area of Kansas City from where Lisa Irwin disappeared. Both cases were newsmakers when they happened. Yet one case is being handled completely different from the other. Had more community members stepped in, like a famous professional football player, might have lent more credence to the Lisa Irwin case. William Browning is a fan of the Kansas City Chiefs after latching on to the team during the lean years of St. Louis football. Born in the gateway city, he is also a lifelong St. Louis Cardinals fan. He currently resides in Branson, Mo. Wow! Way to go Alex Smith. Why No Arrests in the Lisa Irwin Case? The disappearance of baby Lisa Irwin has hit its sixth month and there are no official updates in the case leading to a positive ending. It appears that coverage of this case continues to die down as the weeks progress and it feels as though even detectives have slowed down their interest in the investigation. What's most perplexing about this case is that there have been no suspects or persons of interest named, nor have there been any connected arrests. With all the evidence that has been published regarding the disappearance of Lisa Irwin, why haven't there been any arrests or at least suspects named? The main players in the case all have appeared to be quite suspicious at best and it's strange that there have been no new details regarding investigations surrounding them. Also, isn't it strange that the parents of the missing Kansas City baby have pretty much ceased to make any public appeals for finding their child? It's been several weeks and neither Jeremy Irwin or Deborah Bradley have been in the media in any way. It's disturbing. She has now been missing for half a year. In another six months this case could be officially classified as a cold case if there are no more active leads on which to investigate. Does that mean someone got away with whatever may have happened to the missing baby? The attorney representing Deborah Bradley and Jeremy Irwin claims that the two have been cooperating with police. However, this has not been confirmed by investigators who have long claimed the parents of the missing child stopped cooperating. Who do you believe? Baby Lisa’s story became a national topic fueled by rumor and speculation. Though her parents have not planned a public vigil to mark the six-month point, they remain prayerful that their “Pumpkin Pie” someday will return to her room. Gag me!! The parents of a missing Northland toddler pleaded today on national television for the return of their daughter, and they released information they say could shed new light on her disappearance. It has been more than seven months since 10-month-old Lisa Irwin disappeared from her North Lister Avenue home. Her parents, Deborah Bradley and Jeremy Irwin, say that someone broke into their home and snatched Baby Lisa while she slept. They believe that whoever took her has either sold her or is raising her as their own. During an appearance this morning on NBC’s “Today Show,” Jeremy Irwin said that someone fraudulently charged $69.04 to his debit card in November, the month after Lisa vanished. The charge was connected to an overseas company that helps people change baby’s names, he said. The card was suspended after that charge happened and two other fraudulent charges were attempted. “Somebody had my information and tried to use it,” Irwin told host Ann Curry. The couple said they passed that information to Kansas City police months ago but no new details have emerged with the investigation. Detectives investigated the fraudulent debit card use, said Capt. Steve Young, a Kansas City police spokesman. The card was used to buy stationery but did not appear to be connected to the child’s disappearance, Young said. “We are not optimistic it is going to turn into anything more than stolen card numbers, at best,” he said. Bradley said she and Irwin were frustrated with the lack of progress in the case. They have continued to cooperate with federal and local investigators, she said. According to authorities, Irwin returned home after working a late shift on Oct. 4 and found the front door of their Kansas City, North home open. He walked through the house and found several lights on and his daughter missing from her crib. In the weeks afterward, police, federal authorities, members of the Missouri National Guard and volunteers scoured the area looking for the child. Lisa’s case still is classified as a missing or abducted child. There was no evidence to suggest that Lisa has died, police say. Bradley repeatedly has said that she had nothing to do with her daughter’s disappearance and has pleaded for her return. Bradley admitted that she had been drinking the night Lisa disappeared but has maintained she did not harm the toddler. Their attorney, Joe Tacopina, said police did not thoroughly investigate witness claims that on the night of the disappearance they saw a man walking near the Irwin home carrying a baby wearing a diaper. Young said that accusation “is completely false.” Detectives continue their investigation but there are fewer new leads to pursue, he said. “The detectives have not washed their hands of the case by any means,” Young said. Their frustration with police mounting nearly eight months after their daughter vanished, the parents of a missing Missouri baby are hoping that a fraudulent debit card charge could be the breakthrough that helps authorities find their child. Jeremy Irwin and Deborah Bradley, whose 10-month-old daughter Lisa disappeared on the night of Oct. 4, appeared on TODAY Monday along with their attorney to discuss the latest wrinkles in the case. In early November, just over a month after Lisa vanished, Irwin said his debit card was stolen. The card was suspended for a fraudulent charge for $69.04 while two other charges were attempted. He said the charge was made to a British website that advertises a service to legally change your name or your child’s name online. The Kansas City police said they are investigating the claim, but that it does not appear to be a promising lead or anything more than a routine case of a stolen card. While the case of Lisa Irwin remains open, authorities have found very few leads. “I am a mess,’’ Bradley told Ann Curry. “I am frustrated. It has been almost eight months, and we’re not getting any answers. We understand that the FBI and the KCPD have a job to do, but we need answers. We need Lisa. The answer to us that we are looking at is unacceptable. On TODAY, Jeremy Irwin and Deborah Bradley expressed frustration with the pace of the investigation of their infant daughter Lisa’s disappearance. “That’s a long time for somebody to steal a credit card and wait to try to use it, and that’s one of the reasons why law enforcement will probably cast some doubts on the relationship between the two,’’ former FBI criminal profiler Clint Van Zandt told NBC News. Irwin came home from work at 3:45 a.m. on Oct. 4 to find the door unlocked, the lights on and Lisa’s crib empty. Bradley admits to having had several drinks that night and does not remember the last time she checked on her baby. A witness said that he saw a man carrying around a baby in a diaper around the time Lisa went missing, which is a lead the parents’ attorney, Joe Tacopina, believes should have been urgently pursued. Neighborhood handyman John “Jersey” Tanko, who has a history of break-ins, was questioned by police about his whereabouts that night, but was not declared a suspect. Tacopina also said that a phone call was made at 11:57 p.m. on the night of Lisa’s disappearance on Bradley’s phone to a woman who is Tanko’s on-again, off-again girlfriend. Bradley had never dialed that number before, and her phone was stolen from the home on the night Lisa vanished. Baby Lisa Irwin was reported missing in October of 2011 and still hasn't been found. Her tragic story comes as a reminder to parents that alcohol and watching children just do not mix. You see her mother Deborah Bradley was left to care for the girl and her two half brothers when she chose to drink wine on her front porch with neighbors until she blacked-out, leaving plenty of opportunity for the unthinkable to occur. During the course of Deb Bradley's blackout, the child was either abducted or harmed in the home. With the evidence thus far being what it is, it's unlikely that the child was abducted. That doesn't mean the family is going to abandon the abduction story. In fact, the latest claims made by the family was that an unauthorized credit card charge occurred on a UK website, using Jeremy Irwin's details. They claimed that the site was one for changing birth certificates, but journalistic research showed otherwise, as did police investigation. The claims made by the parents of Lisa Irwin have never checked out by police. Why do you suppose that is? Now the great-aunt of the missing child is speaking out in hopes of still finding the little girl, but her words seem to only play off of the nonsense regurgitated over and over by Deborah Bradley and Jeremy Irwin. It really seems like this case is at a total standstill because of the lack of cooperation by the parents, who appear to only speak to interviewing bodies that can pay them, like Dr. Phil. Perhaps that is why the great aunt spoke and not them? Nearly a year after infant Lisa Irwin vanished from her Kansas City home, her mother remains convinced the girl will be found alive. "Absolutely," Deborah Bradley said Thursday outside her single-story house, in response to a reporter's question on the matter. The home has a large sign in the picture window with the words "kidnapped" above Lisa Irwin's image. The girl's disappearance drew national media coverage for weeks. Lisa, then 10 months old, was not in her crib when her father Jeremy Irwin, returned from work at 4 a.m. on October 3, 2011. Bradley had put the baby to bed and went to sleep in another room, she said. Bradley admitted to getting drunk that night. Police questioned Bradley and Irwin extensively in the hours after the baby's disappearance but then said the couple stopped cooperating. The couple mostly confined media interviews to national television shows, where they said police were too accusatory. Bradley said Thursday the couple doesn't intend to do network television shows next week to talk about the case. "We are on the investigation side right now," Bradley said. She declined further comment, but said reporters are invited to attend a candlelight vigil outside the family's house on October 3 to mark the anniversary of Lisa's disappearance. Captain Steve Young, spokesman for Kansas City police, declined to discuss the level of cooperation investigators are getting from Bradley and Irwin but said that will be part of a statement on the case released Friday. John Picerno, a Kansas City lawyer for Bradley and Irwin, said Thursday they are now giving "100 percent and complete" cooperation to police. He said police "are doing what they can" to find Lisa. "There is no question she was kidnapped," Picerno said. "If there was any foul play involving Deborah or Jeremy we would heard about it by now." Picerno said tips about Irwin's sightings are called in often and forwarded to police. While the girl's looks would be a lot different a year later, he said she has distinctive blue eyes. Young said police are still getting tips in the case. "They come and go," he said. Missing baby Lisa Irwin still hasn't been found and her disappearance is nearing its one year anniversary. Most perplexing in this memorable case is that the mother, Deborah Bradley, has not yet been arrested in connection with the girl's disappearance. Mommie dearest herself admitted to the media last year that she's a suspect and would be in jail over her daughter's disappearance eventually. She even admitted to failing a polygraph. This naturally led to the family ending comments to the media and they lawyered up with John Picerno. Now they only speak in very controlled national media interviews. Isn't that special? "There is no question she was kidnapped. If there was any foul play involving Deborah or Jeremy we would heard about it by now." Well, certainly the parents of Lisa Irwin feel relieved by this sentiment displayed by their attorney, but Picerno is actually wrong. It could take years before an arrest is made if Deb and Jeremy are at all responsible. There isn't a year expiration date on child disappearances, especially ones that could be potential homicides. Take for instance the disappearance of Jhessye Shockley. She had been missing for about a year, and still hasn't been found, but her mother has just now been charged with murdering the little girl. If there is any chance at all that Deb Bradley had anything to do with the disappearance of her baby, investigators will eventually gather the needed evidence to prove it -- and then she will most likely be charged. Again, that's if she is responsible. 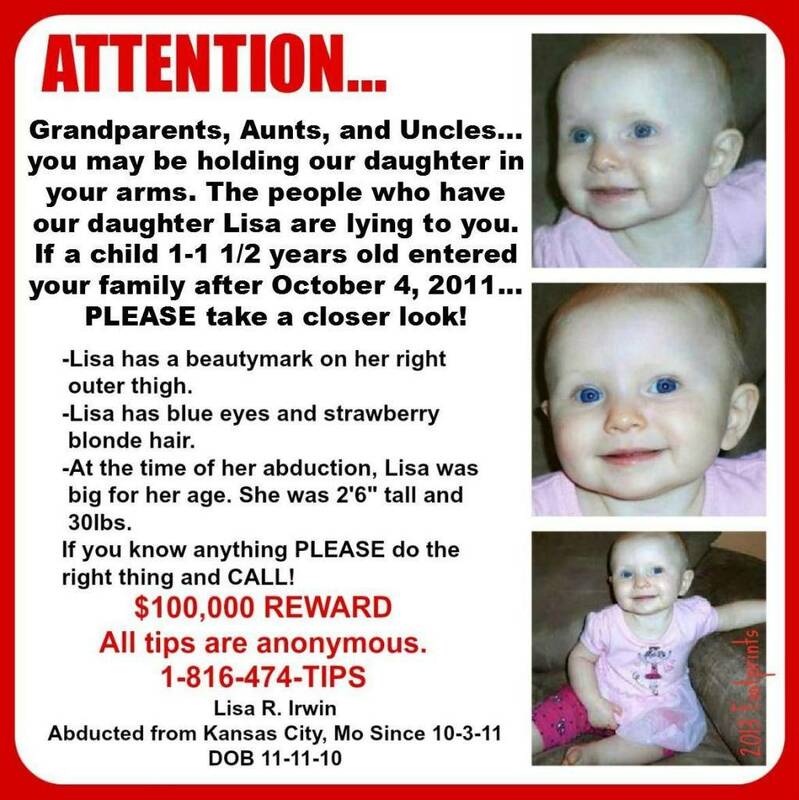 Baby Lisa has been missing for nearly a year, but one day she will have justice. KANSAS CITY, Missouri (Reuters) - The mother of missing Missouri baby Lisa Irwin has still not provided answers needed in the investigation into her daughter's disappearance from her home nearly a year ago in a high-profile case that drew national attention, police said on Friday. Baby Lisa was last seen the night of October 3, 2011, when her mother, Deborah Bradley, says she put the then 10-month-old in her crib. The baby's father, Jeremy Irwin, discovered she was missing when he got home from work before dawn the next day, he has said. Kansas City police said in a statement on Friday that the family was in touch with investigators but has still not given them the "opportunity to sit down one-on-one" with Bradley. "As the only adult in the home at the time of the baby's disappearance, police continue to have questions to which only she can provide answers," police said. Bradley has admitted to getting drunk the night Lisa disappeared. But John Picerno, a Kansas City lawyer representing Bradley and Irwin, described as "completely false" the police assertion that Bradley has not been willing to be interviewed. He said she gave a videotaped interview to the FBI and a Kansas City police officer several months after Lisa disappeared and provided 100 pages of hand-written notes. She remains willing to talk to police, he said. "My door is always open, they know my phone number," Picerno said. In a brief interview with Reuters outside her home on Thursday, Bradley said she was focused on helping with the investigation and that she "absolutely" believes Lisa is alive. Bradley said she is convinced the girl was kidnapped. Police and the FBI have followed up on 1,667 tips on the child's disappearance, including some 500 reported sightings of the girl, the police statement said. They are checking into about a dozen active tips now, police said. "Police have exhausted leads provided by Lisa Irwin's family and their attorneys and the leads were of no benefit to the investigation," police said. Picerno said he will continue to provide tips to police but cannot control whether they lead anywhere. Wednesday will mark the one year anniversary of the disappearance of Kansas City, Mo. baby Lisa Irwin, and as the date approaches, her parents released a statement regarding their daughter, reports KMBC. The Irwin family home on North Lister in Kansas City, Mo., looks deceptively normal. The father leaves every morning to go to work while the mother stays at home to care for the couple's two young boys. In the afternoon, neighborhood kids can be seen playing in the yard. But inside the house is a little girl's room that has been virtually untouched for a year. The room belongs to baby Lisa Irwin who vanished from her crib, seemingly without a trace exactly a year ago on Wednesday. "They've got Lisa's room intact," Irwin family attorney John Picerno told ABCNews.com, referring to Lisa's parents Deborah Bradley and Jeremy Irwin. "They still try to honor her. They still believe that she is alive. They buy clothes that will fit her when she comes home. They try to buy gifts for her to celebrate the various holidays as the holidays pass." Lisa disappeared the night of Oct. 3, 2011 from her home and the family has maintained from the beginning that the girl was abducted from her bedroom inside the home while her father was at work and her mother and brothers were asleep in another room. Deborah Bradley, 26, and the girl's father Jeremy Irwin, 30, became a focal point for suspicion by both the public and the police. The relationship between the parents and the Kansas City Police Department has been contentious, with frequent public sparring between the two. They argued about issues including the extent of the parents' cooperation, polygraph tests and interviewing Lisa's two young brothers. One year later, the tense relationship has resurfaced as unsatisfied police suggest that they are still seeking more information from Bradley. "Police have exhausted leads provided by Lisa Irwin's family and their attorneys, and the leads were of no benefit to the investigation," the KCPD said in a statement. "While communication with the family has been ongoing, police have not had the opportunity to sit down one-on-one to speak with Lisa's mother, Deborah Bradley. As the only adult in the home at the time of the baby's disappearance, police continue to have questions to which only she can provide answers." Picerno said he and his clients were taken aback by the police's statement. "We were very, very surprised that KCPD, first of all, issued a press release in and of itself," he said. "Second, we were surprised with the tone of the press release, particularly since we believe that what's in the press release relative to Jeremy and Deborah is simply untrue." Picerno acknowledged that there was a breakdown in communication between authorities and the parents after over 30 hours of initial questioning with the couple. He said that Bradley and Irwin sat down with police again in February, but conceded that Bradley has not sat for a one-on-one with investigators. "They haven't but they can certainly sit down one-on-one with me present and ask any questions," he said. "I'm not going to stop them. What we don't want is another situation where they're doing a full-blown interrogation where they're standing up and accusing her and they're showing pictures of her missing girl and they're confronting her with all this evidence." Picerno said his client has a right to counsel and "a right not to be abused or threatened by detectives." When asked if he believes investigators suspect Bradley, he responded with caution. "You can look in the media. I think it's pretty obvious where they're at," Picerno said. "They've said she's not a suspect so I'm not going to quibble over the words. But I think if you look back over what's been in the media and what they've said over the last year, what they think, I think, is pretty obvious. It's obvious to me." Bradley faced public scrutiny in the days following Lisa's disappearance due to her changing timeline of the events of the night and the revelation that she had been drinking the night Lisa disappeared. "Pretty much the only thing that I'm guilty of is drinking too much. And even when she comes back, that's something I have to live with, that I might have heard something and been able to stop them," a tearful Bradley told Dr. Phil McGraw in February. She said the issues have been blown out of proportion and that she is neither an alcoholic nor a neglectful parent. "It is literally impossible to remember every single detail and say it exactly the same every single time and there are so many negative people or hateful people that have picked it all apart," Bradley said. "If I had done something, I'd be in jail right now." The family is planning a vigil for Wednesday evening with family, friends and supporters. "We want to thank everyone for continuing to help look for Lisa and for the overwhelming support," the parents said in a statement this week, according to ABC News' Kansas City affiliate KMBC. "Every day without her is hard and there is no such thing as normalcy anymore. Every day we wake up hoping it will be the day she comes home to us. Until that day happens our family will continue to be incomplete without her." At least one KCPD detective and one FBI agent work on the case every day, police said. They have investigated over 1,600 tips and said they are looking into about a dozen tips at present. Five hundred of the tips have been reported sightings across the U.S. and internationally, police said. Each reported sighting has been investigated, but none were determined to be Lisa. Police say they have gone back over nearly 100 previously closed leads, re-interviewed connected parties and re-evaluated forensic evidence. "It's been tough for a long time," Capt. Steve Young told ABCNews.com. "It's still an open case and we still seek and need quality tips and leads." Despite the differences between police and parents, hope remains on both sides. "We'll follow up on every tip and we hope that one of those tips leads to that conclusion," Young said. "We all hope that she's out there," Picerno said. "Until someone finds her and she's not alive, we all hope and believe that she's out there somewhere. We just hope whoever took her is taking care of her." There is a $100,000 reward for any information leading to Lisa. I don't believe one word the "parents" or Picerno says and I think he told them to buy new clothes & gifts for Lisa to make them look good. The answer lies with the Mother and she ain't talking. That's just how it goes these days. Looks like maybe she's going to get away with it. JMOO. But it sure makes my blood boil. If they have not arrested her yet, I doubt they ever will. KANSAS CITY – It’s been more than a year since Lisa Irwin disappeared from her Northland home. Despite the offer of a $100,000 reward, a separate Lisa Irwin organization is now soliciting donations from the public – and some are questioning why the fundraising is necessary. The “Find Lisa Irwin” website claims all the donations will be used to raise awareness and to bring Lisa home. But this foundation is not registered with the Missouri Secretary of State. The communications director for that office says because it’s not registered, the state doesn’t know if it’s a legitimate nonprofit organization. On the official Lisa Irwin website there’s now a donate button where you can make a contribution through Pay Pal to the Lisa Irwin Hope Foundation. The site claims donations also are accepted at any Wells Fargo branch. The solicitation suggests money will be used to print and mail flyers, and produce bracelets, shirts and bumper stickers. Cherri West and her family have benefited first-hand from the generosity of others. After her daughter, Pamela Butler, was kidnapped and murdered 13 years ago, Kansas Citians opened up their hearts and wallets, donating more than $100,000 to a fund for West’s family. “You should know who set it up, and who has control over it,” West said. She’s thankful that donors made the fund into a trust, with volunteers serving as trustees to guide her on how the money should be spent. Instead of giving money to others who wanted it, West says she was able to buy a home, furnish it and recevie an allowance every 6 months to buy clothes for her two surviving daughters. When the youngest girl turned 21, the remaining trust funds were split three ways. One daughter used the money to purchase a home, another to buy a car, and west says she used her share to pay bills. But she shudders to think what would have happened if there were not strict rules governing her fund. FOX 4 News talked with the woman who established the account for the Lisa Irwin Hope Foundation. She is Kathleen Costas, a cousin of Lisa’s mother, Deborah Bradley. Costas, who lives in Florida, says the account is a special taxable fund established through Wells Fargo. Costas oversees all spending from the account. Costas says it will only be used to pay for bumper stickers, flyers and other materials used in the family’s search for Lisa Irwin. Check out what a friend posted on my FB page today! Please remember Lisa is 2 years old now. So while she will not looking completely different...she will be a toddler. She will have more hair. More teeth. And be a bit taller. But that those gorgeous baby blues and that sweet face will be recognizable. Thank you to everyone who is sharing this. It is so important that the awareness for Lisa is still out there. She needs to be brought home! The poster is nice but too bad there's so much behind it. YUP!! Another one that will NEVER be found!